If you want to write a best-selling series, there are some safe bets when it comes to subject matter. And, if you’re really reaching for the stars, you can combine any of these categories for something truly special. Post-apocalyptic wizards! Magic-potion-wielding werewolves! 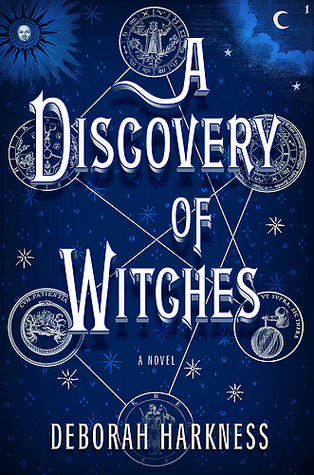 With A Discovery of Witches, that’s just what Deborah Harkness did. She combines vampires and witches . . . and, for good measure, adds in time travel and forbidden love! It’s truly a recipe for success. Yes, A Discovery of Witches seems like just another cheesy and formulaic trilogy (if you’ve read one, you’ve read them all), but it’s surprisingly engaging. Diana Bishop is a witch from a long line of very powerful witches. But she’s a traumatized witch–her parents (themselves both very powerful witches) were murdered when she was only seven. She believes that her parents were killed because they were witches, and, thus, she has sworn off the use of magic. Instead, she relies on her smarts. She is a well respected historian, currently doing research at Oxford, studying the history of alchemy. One night, in Oxford’s Bodleian library, Diana requests an old manuscript called Ashmole 782. At first, the book is impossible to open, but when Diana places her hand on its cover, it allows her to see its contents. The pages swirl with words beneath the surface that she cannot read. Sensing that it is a magical text, Diana quickly returns it to the stacks. Diana’s discovery of Ashmole 782 is like a siren call to all the vampires, witches, wizards, and daemons (“creative, artistic creatures who walk a tightrope between madness and genius”) near Oxford. Soon, the library is swarming with creatures. Diana does not know why they are so interested in her and in Ashmole 782, but she fears the humans will soon notice all of them. Diana is oddly drawn to one vampire in particular, a fiercely attractive professor named Matthew Clermont. As soon as Diana discovers Ashmole 782, Matthew is omnipresent. He seems as interested in Diana and her safety as he is in Ashmole 782. A Discovery of Witches is part forbidden romance (a witch like Diana and a vampire like Matthew obviously can’t love each other! ), part mystery (Why is Ashmole 782 so important to creatures? What information does it hide? ), part suspense (To what lengths will creatures go to get their hands on Ashmole 782 and the information Diana has? ), and part fantasy (magic and witchcraft and such). There’s also some science and history thrown in for good measure . . . but nothing very deep or thinky. I have a confession to make: I secretly love cheesy, formulaic series. I have read at least one of all of the above-mentioned series (and many, many more like them). They’re the kind of fluff that I happily devour in a single sitting. They’re super quick reads, they’re generally entertaining, and they’re completely mindless. They’re the perfect books to read with a cup of tea in front of the fireplace on a cold, winter’s night or on an airplane or on vacation. This one is actually better than most (it’s not quite as good as The Hunger Games or Harry Potter, but it’s way better than Twilight or Divergent). If you’re a fan of formulaic series, then you’re definitely going to like this. It’s all the things you’ve come to expect from a series: ridiculously long (but nevertheless very quick reading), unrealistically romantic, with fun magic/fantasy elements (witchwater and witchfire and time-walking!). It’s entertaining fluff. And–bonus!–this book also has some interesting historical elements. Harkness has a day job: she’s a professor of European history and the history of science at the University of Southern California, so she knows her stuff. It’s not boring at all–it’s fun stuff like the Knights of the Templar and alchemy–but it makes the book feel smarter than your average series. On the negative side, like a lot of series (Twilight springs to mind), there is a damsel-in-distress element (coupled, of course, with a domineering male) that isn’t particularly attractive. Diana is presented as a strong, smart, self-sufficient chick at the beginning of the book . . . but as soon as Matthew shows up, she becomes significantly more submissive. She has moments of strength, but Matthew is definitely in charge. I didn’t love that. Also, this is not a stand-alone book. As I’ve mentioned before, this is a pet-peeve of mine. Each book in a series should have a beginning, a middle, and an end. This book decidedly does not. The ending is just a huge cliff-hanger. Does it make me want to read the next book in the trilogy? Yes. But it’s also really annoying. Who should read it: Mom (i.e., people, like me, who really enjoy objectively terrible but subjectively delightful book series). Still not sure? You can find out more about the trilogy and read excerpts of each book on Deborah Harkness’ website. This entry was posted in Rating: 3.5/5 and tagged A Discovery of Witches, Book review, Book Reviews, Books, Deborah Harkness. Bookmark the permalink. Thanks for this post! I’ve almost picked them up 3-4 times and always hesitate. I’m going to grab it next time I’m in a reading slump! You’re welcome! Once you read it, I would love to hear your thoughts on it. Keep me posted!